Kartik Aryan will soon be seen sharing screen space with Ananya Panday and Bhumi Pednekar in the remake of the hit 1978 movie Pati Patni Aur Woh. Bollywood actor Kartik Aaryan, who made his Hindi film debut in 2011 with the movie Pyaar Ka Punchnama, is on a career high. After the success of Sonu Ki Titu Ki Sweety, he has a lot of projects in his kitty. The 28-year-old actor unveiled his first look from the film on Instagram on Tuesday morning. In the photo, Kartik is seen in a deglam avatar, sporting a moustache, alongwith a checkered shirt and a dark green coloured trousers. We couldn’t help but notice how Kartik’s plain formal look was quite similar to that of Shah Rukh Khan from Rab Ne Bana Di Jodi, sans the specs. On Monday, Kartik shared that the film has gone on floors. 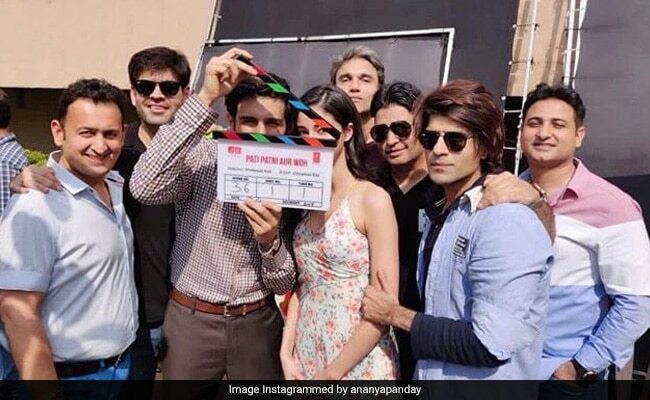 He posted a photo in which he and Ananya can be seen holding a clapper board standing next to Mudassar Aziz, who is directing the film and producers Bhushan Kumar and Juno Chopra. Bhumi, who is playing the second lead in the film, is not part of the picture. Apart from this, Kartik is gearing up for the release of Luka Chuppi which marks his first collaboration with Kriti Sanon. The movie has been directed by Laxman Utekar and has been produced by Dinesh Vijan under his banner Maddock Films. The rom-com is woven around Kartik and Kriti’s character and how they opt for a live-in relationship instead of getting married. It is slated to release on March 1. Milan Talkies is an upcoming Hindi movie scheduled to be released on 15 Mar, 2019.